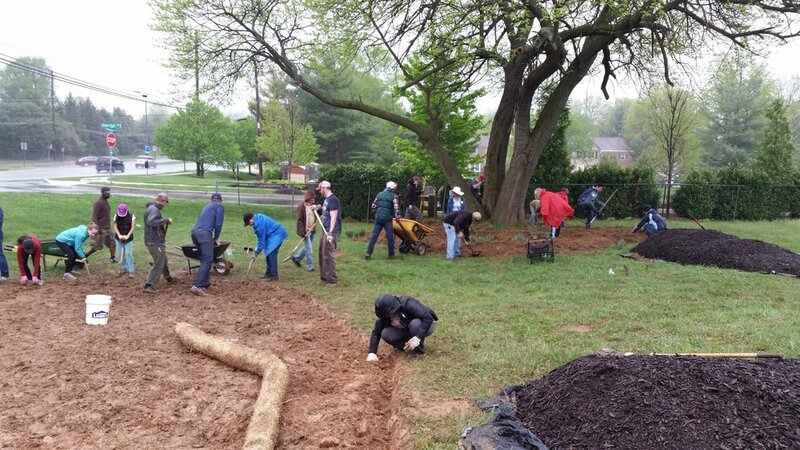 Earth Stewardship East used a $25,000 grant from the Chesapeake Bay Trust to complete a storm water management, native plant landscaping and public education project on the historic African American site, Pleasant View, 11810 Darnestown Road, Gaithersburg, MD. We matched that grant with ~$34,500 in donations of plants, supplies, and volunteer labor. Please join us in this amazing on-going project -- and share in an historic celebration of 150+ years at Pleasant View. To date we've had 330+ volunteers help with our Pleasant View garden. THANK YOU! Future work includes adding rain barrels, benches, birdhouses, stone edging, as well as mulching and weeding. Lisa Wade and two young men helped weed out all the hairy bitter cress and other cool weather weeds. They want to come back to help more.Thanks! Celebrate the completion of our Pleasant View project as we prepare the native plant garden for spring. 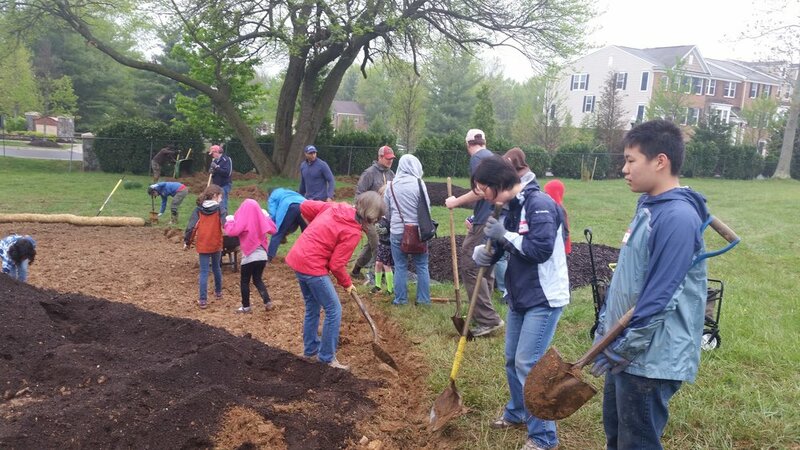 Members of The Church of Jesus Christ of Latter-day Saints from the Kentlands Ward and Montgomery Branch will weed, mulch, edge, and plant in the garden. Others are most welcome to join us. Most plants will just be starting their season’s growth so it’s a good time to get all the invasive weeds out. 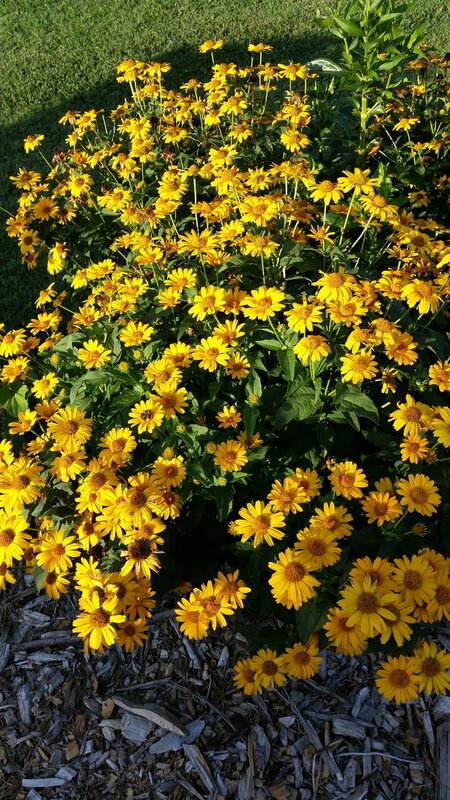 Photos below remind us of summer blooms to come! Youth age 11+ are welcome but need parental supervision. BYO shovel, work gloves or other useful tools. Contact Merikay with questions: merikays@verizon.net. 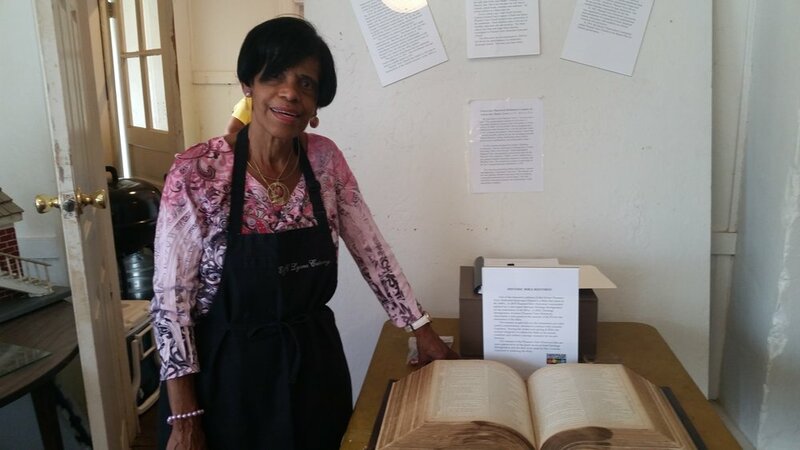 A major benefit of our Pleasant View project has been learning the history of this African American site — especially the first-hand history shared by former students of the historic segregated one-room schoolhouse. 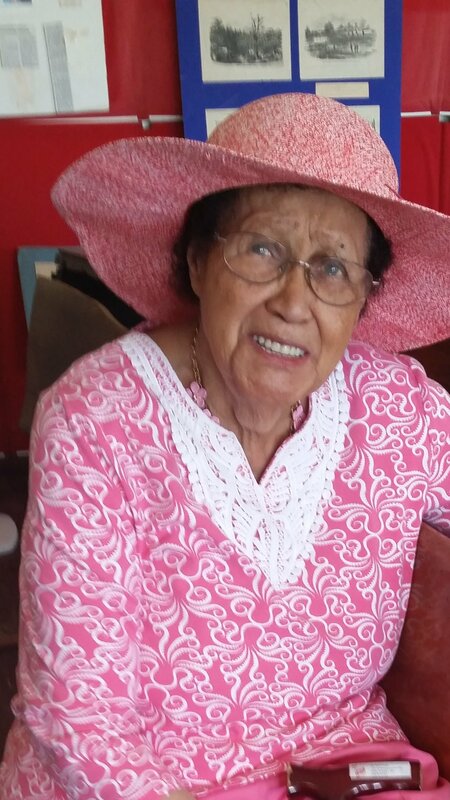 Pearl Green (age 100), Thompkins Hallman, Carolyn Thompson, Betsey Hebron, Melvin Joppy and others have come to our events and shared their Pleasant View experiences. This has added a wonderful dimension to our project experience. 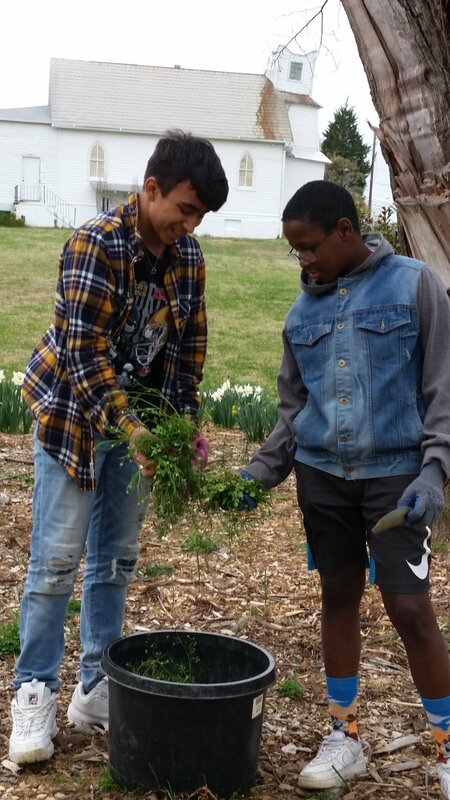 Besides creating an opportunity to learn local history, our project at Pleasant View focused on teaching others about the benefits of native plants and ways to improve storm water management. 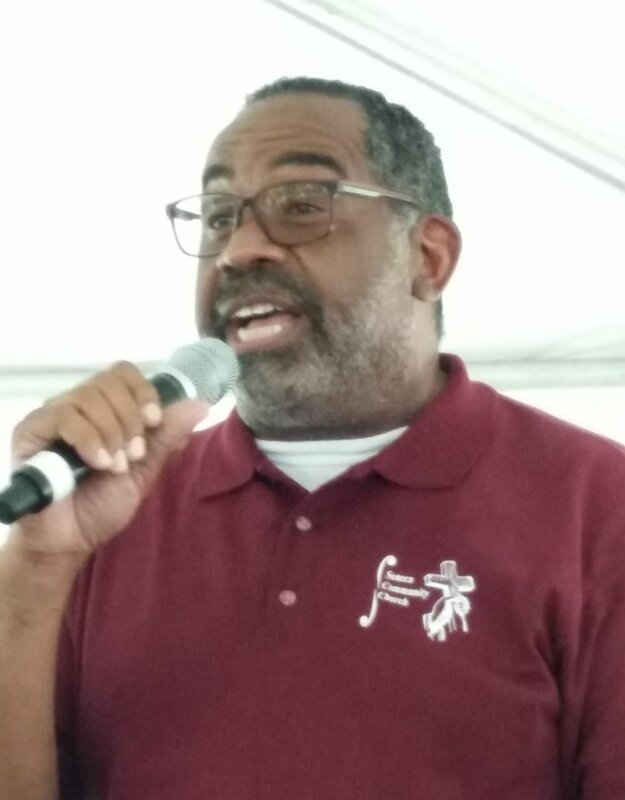 Merikay Smith, long-time Master Gardener and Project Leader for the Pleasant View project, created and gave two presentations as part of our grant: one on the benefits and use of native plants in home gardens, the second on storm water management. 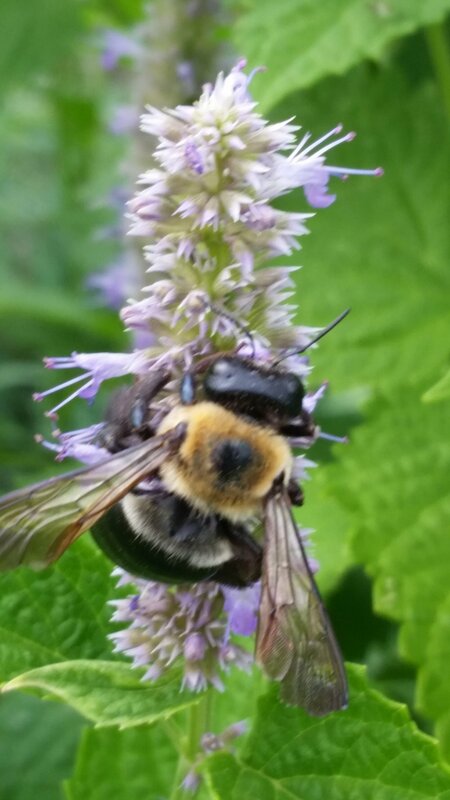 If you missed these talks, you can still learn much from visiting our native plant garden and replacing at least some of the lawn or invasive plants on your property with native plants. We have also hosted public educational tours of the gardens and will do so again in the future. 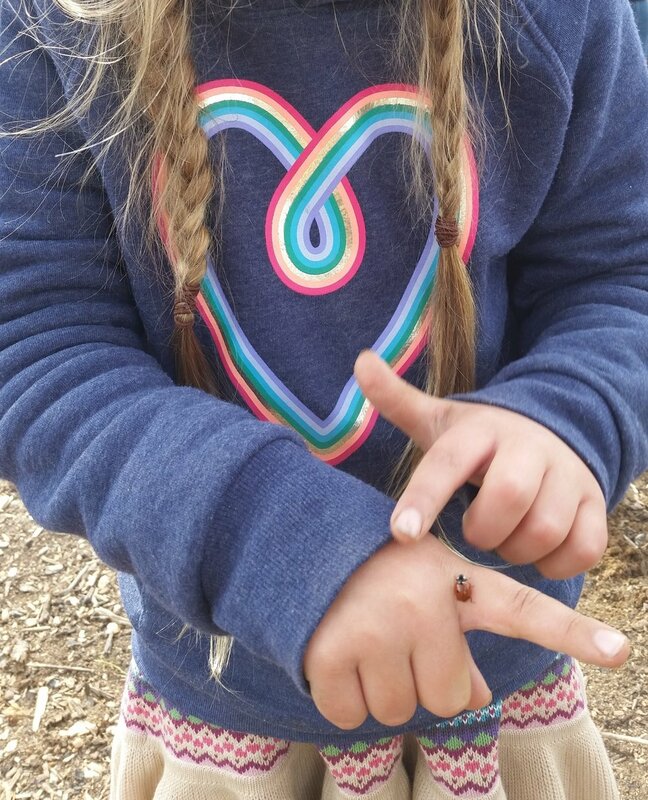 Since education is part of our mission we designed the garden with a variety of species so you can visit it to get ideas for what might grow for you at home. We spent ~$500 on plant ID tags to help you learn what we have planted. See what the deer and groundhogs are browsing and what is thriving. 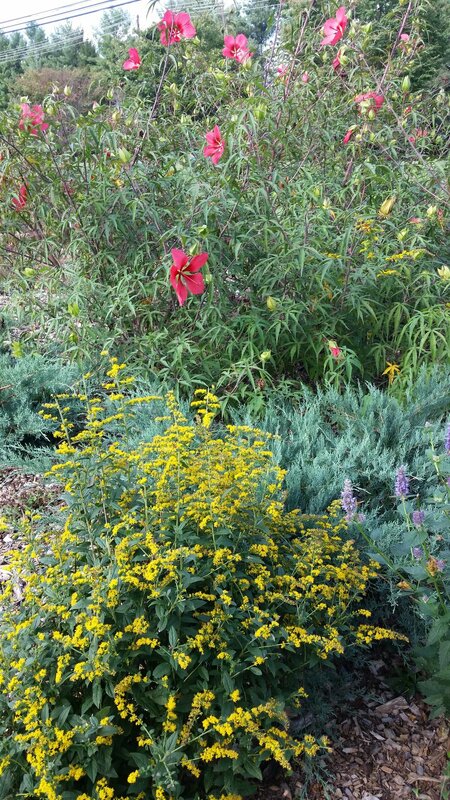 For more info on native plants -- all you need to know for creating your own native plant garden -- click "Our Nature" then "Native Plants" on this website main menu. There's a general planting plan and a plant list at the end of this page. We've planted 29 native trees and three sunny flower beds totaling 3,663 square feet where we replaced turf with native plants in 2017. We added a layer of compost, cardboard and mulch under the remaining shade tree. In 2018 we dug shallow, small holes in this new ~2,000 square feet bed where we planted native shade plants for more than 5,600 square feet of habitat. To help visitors understand why we did the conservation landscaping and ways they too can help, we created and installed two educational signs. Kate Cummings helped with the sign design, Justin Smith dug in the posts, and John Mansfield did the sign installations. See photos of these signs below. Among the Pleasant View plants will be some you may want to plant in your garden too. 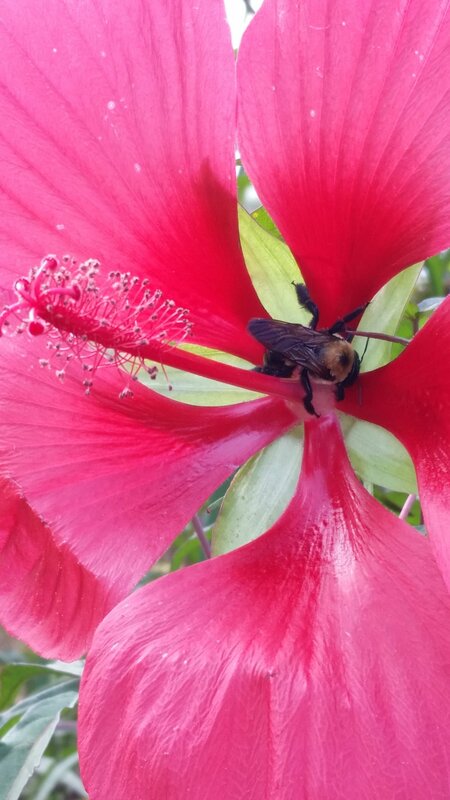 Photos below show some of the plants and pollinators summer of 2018. More than 80 volunteers joined us for a Day to Serve project on September 22 from 9:30 am to noon. Most were members of the Bethesda and Potomac congregations of The Church of Jesus Christ of Latter-day Saints. Pleasant View Trustees Carolyn Thompson, Tomkins Hallman, and Melvin Joppy along with Betsey Hebron shared their experiences of attending the historic colored school. We planted ten more native trees, weeded tree circles and flower beds, then spread a mountain of mulch. Men worked on resetting tilting cemetery stones. Key leaders were Vesna Mirjacic, Winston Wilkinson and Paul Wright who organized the event for their wards. Winston had not been to Pleasant View before but learned that he has relatives buried there — and at our event he met Melvin Joppy, a cousin and Trustee of PV. This was a Day of Service to remember. Click above photos to see full gallery. Can't come on a volunteer date but still want to help? Don't know a weed from non-weed? You're welcome to weed around our new trees. Keeping the circles at the base of trees free of weeds helps new trees grow faster and better. Trees thrive if they don't have to share water and nutrients with weeds or turf. Anything growing into the mulch under the tree is a weed. Use photos below as a “how-to” guide. Thanks! We weeded the garden at Pleasant View on July 21 and July 28. 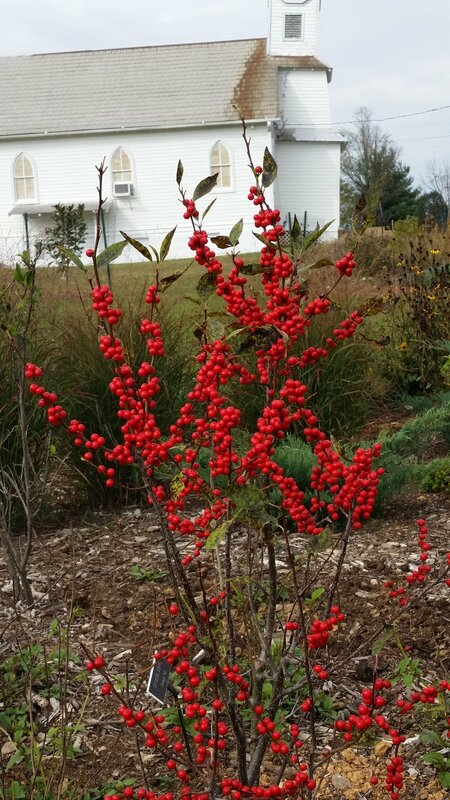 Pope Farm is donating 100+ additional native plants to us. Thanks to our rain the plants should be able to survive being planted now. Special thanks to Dara Ballow-Giffen for getting the plants. 136 new native plants have been added to our garden donated from Pope Farm, planted by this mother/daughter team plus Jeff/Merikay! Photo above is of mother and daughter who worked together in our native plant garden for Student Service Learning (SSL) hours and both seemed to enjoy it. Photo below shows two of our four planting areas. 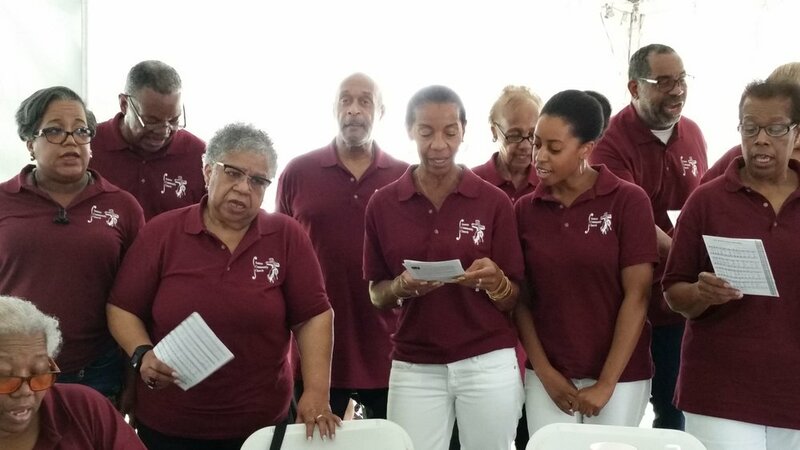 "We've Come This Far By Faith" sung by Pleasant View folk served as a great theme for the 150th celebration. We had scrumptious pork, chicken and beef BBQ. 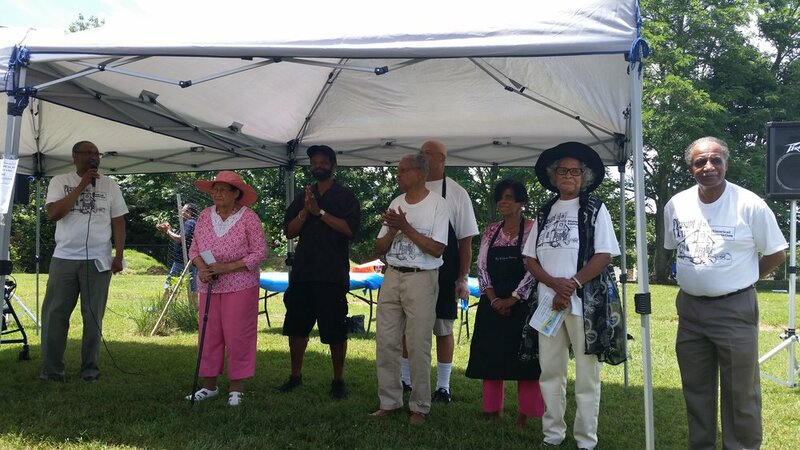 Various political leaders including county executive Ike Leggett and the mayor of Gatihersburg gave appropriate declarations including naming the day for Pearl Green whose 100th birthday we celebrated. She even got a personal letter from President Obama eloquently expressing his appreciation for her life. We were inspired by the legendary Chris Gardner (Pursuit of Happyness fame and more). The Seneca Gospel Choir sang as did the Royal Harmonizers. Both the historic school and church are in serious need of structural renovations so there were opportunities to donate towards their preservation. We had a table at the garden area with information about native plants, habitat creation, and storm water management. Thanks to Lauren Hubbard and Vicky Clark for helping. Many ESE volunteers came to the celebration as well as a few people new to our group. Photo of volunteers above, Earth Day 2017. We celebrated Earth Day 2018 by planting 5 trees and lots of shade perennials. Thanks to the 28 volunteers who helped. We were happy to have Bill Phillips, Regis Canny, Eryn Chastain and her daughters from Fairhaven join us. Rev. 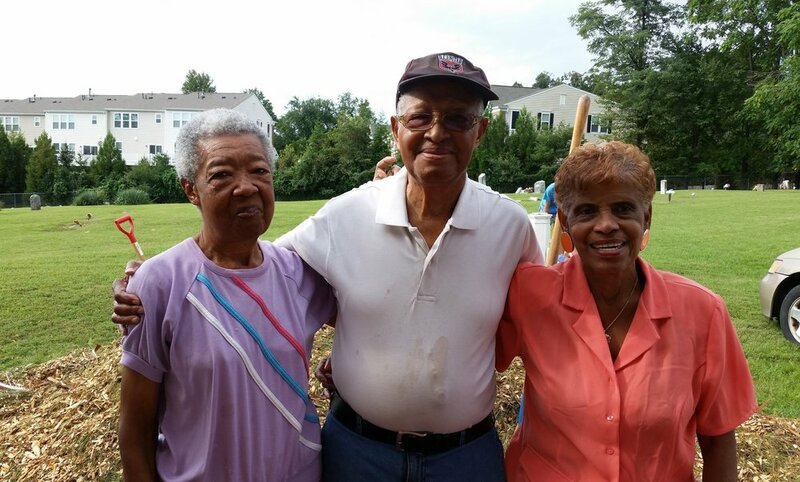 Gerard Green, Rita Green, Carolyn Thompson and Melvin Joppy, Jr. have been regular volunteers and PV Trustees. Laurie-Anne Sayles, City Council of Gaithersburg, came with her husband. 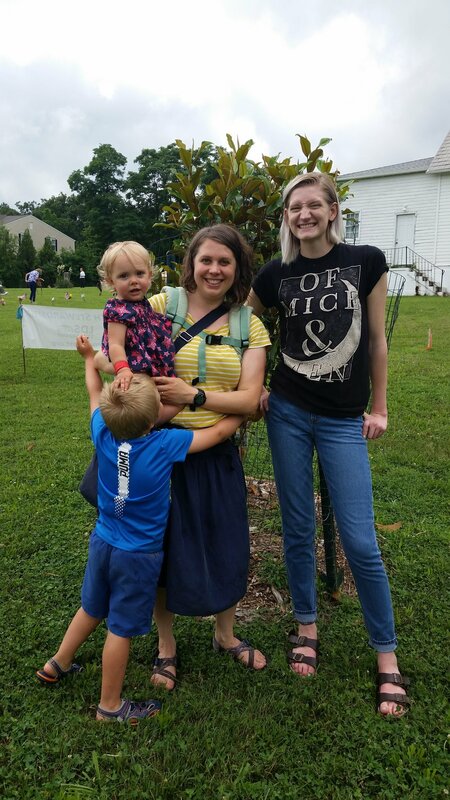 LDS volunteers: Lauris Hunter, Celia Paulsen, and Bill and Maura Pratt (and their children), Laura Friend (what a great name) and her children. Jeff Smith, who spent 7 hours on Saturday helping with PV claims to enjoy it which allows Merikay to enjoy it too! Click on photos below to see April 21, 2018 event. Members of the ROI All Stars came several times to Pleasant View and weeded around the base of PV trees. Many of these were planted by another group and never got the cardboard/mulch treatment. You can see what a difference it makes to protect new plantings with a layer of weed suppressing organic matter. Here’s a before and after weeding comparison. Thank you ROI. The Potomac Garden Center donated bulbs for our Pleasant View garden. There were a few narcissus growing under the large tree planted some time in the distant past. Among the bulbs donated and planted in November 2017: 'Ice Follies,' has been grown since at least 1953. 'Mt. Hood,' since 1934. 'Jack Snipe' is pre 1951. 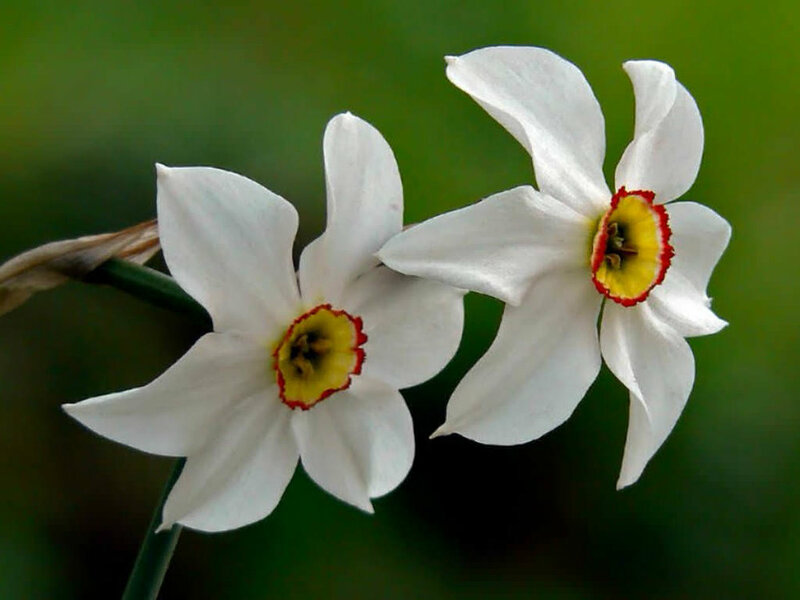 Narcissus poeticus is a species daffodil, grown in gardens as it appears in nature. Hyacinths 'Delft Blue' (1944) and 'Blue Jacket' (1953) along with 'Pink Pearl' (1922) are now in the Pleasant View garden. 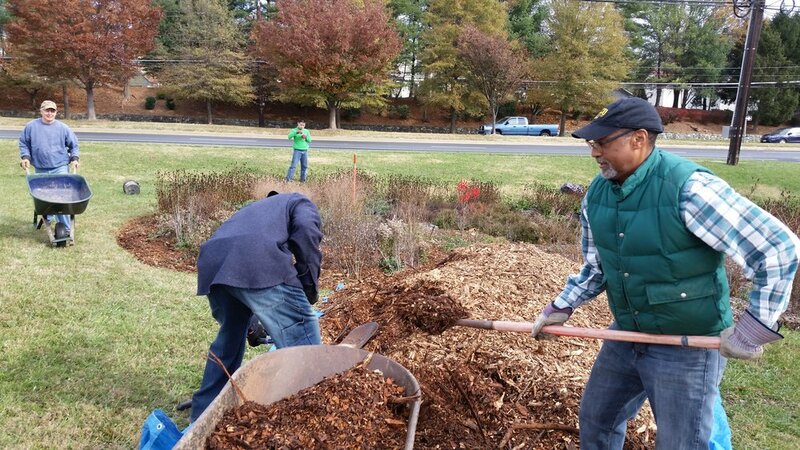 With 20 volunteers we spread mulch, planted trees, and prepared the beds for winter. 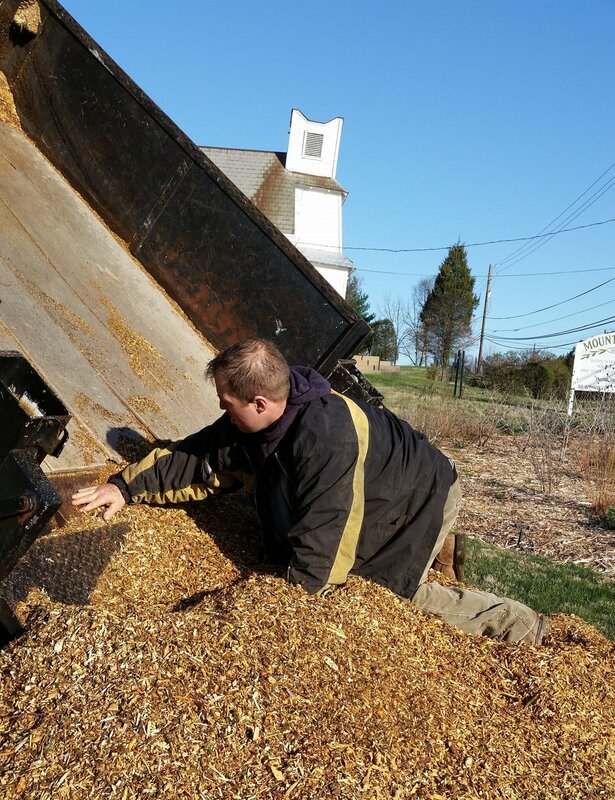 Special thanks to Matt Markoff for donating three loads of shredded wood for mulch and to Chief Markoff for bringing extra wheelbarrows. Also to Jeff Smith for helping to setup the event and staying after to put deer protection on the newly planted trees and perennials. Rev. Gerry Green, head Trustee at Pleasant View, was also on hand to help shovel. Thanks to all our volunteers the garden is ready for winter. Above, a view of the garden on Nov. 3, 2017. New shrubs with bright fall colors have been added. Click to see the photos. 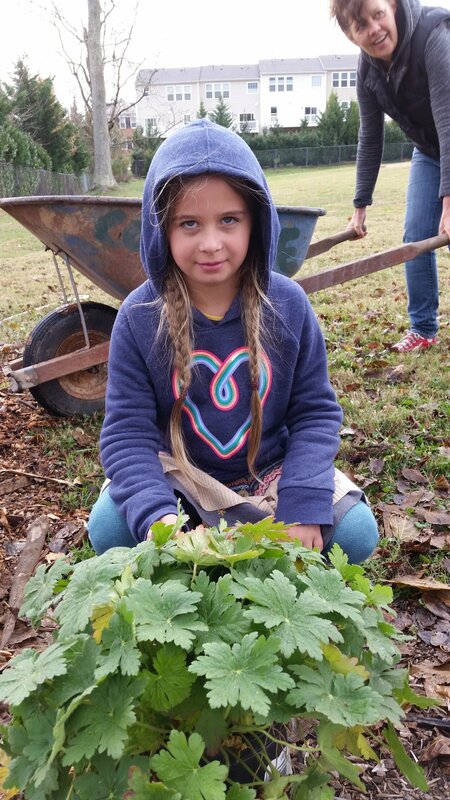 A Girl Scout troop led by Dusti Conner, a group from ROI, Bishop Chris Matthews and other volunteers joined us on September 11 to prepare our native plant garden for fall. We weeded the beds and also many of the tree circles. Special thanks to Carolyn Thompson for bringing refreshments and to Eric and Gaylene Raynor for celebrating their anniversary with us. Click photos below to see how the garden looked July 15 and August 19, 2017. Thanks to all who've helped at Pleasant View, especially our watering crew of Patty Dirlam, Angela Ellis, Mary Hlavinka, Melvin Joppy, Carolyn Thompson, and Celia Paulsen. Today (June 30) I noticed native pollinators are already present in the garden including native bees, skippers, and a fritillary. Also saw two yellow finches, a dove, and several other birds visiting the beds. I've started adding a few name tags (thanks to Dara Ballow-Giffen). We're making progress on the weeds (thanks to any who have helped). We learned about native plants for shade and sunny areas -- including many of the plants in our new Pleasant View garden. Merikay spoke for an hour to a packed house covering how to design gardens for habitat, plant selection, sources of native plants and more. If you missed this talk but want to learn, come to our next free lecture. They'll be posted on our events page. We'll host at least two more talks. 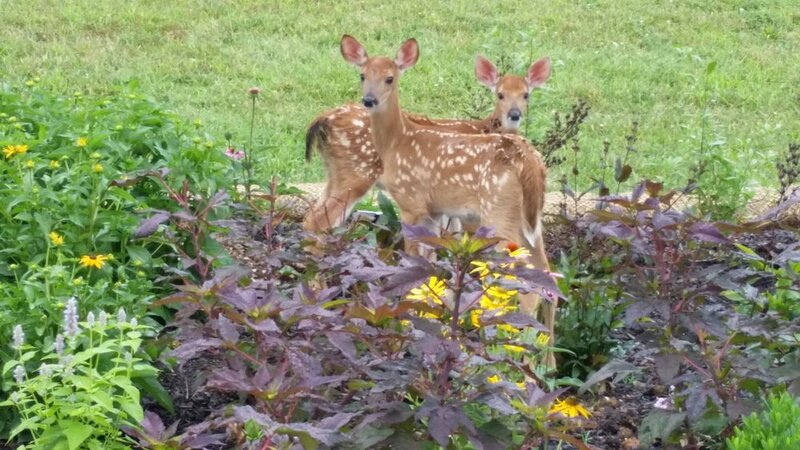 Yes, we have deer who eat meals thanks to our garden. 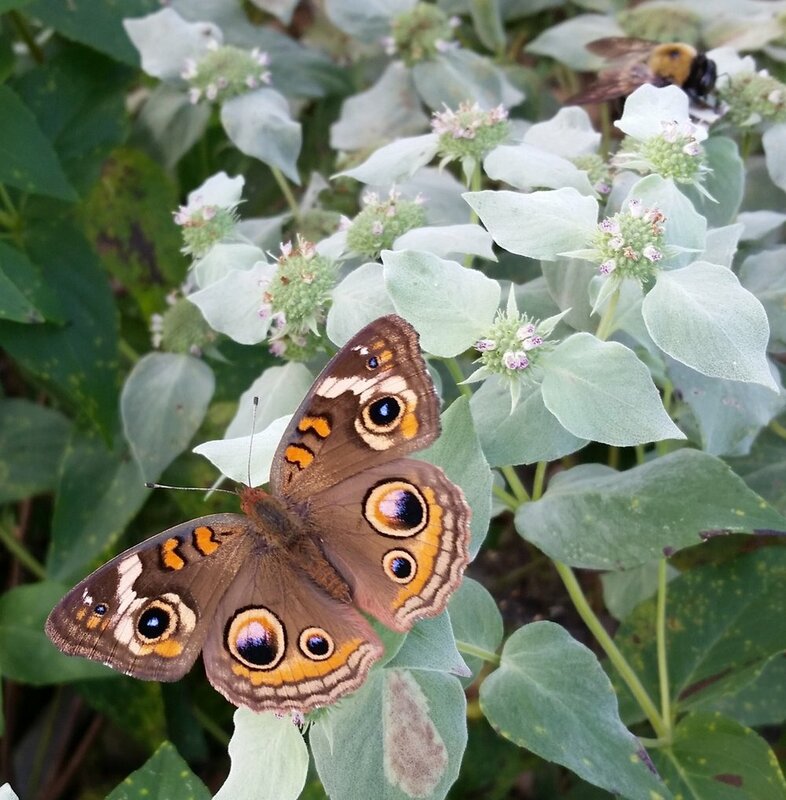 Our defense: many of the plants we've chosen are not their favorites, we use deer spray, and interplant plants they dislike (strong scents help like mountain mint) along with the ones they like. We lose some but most are holding their own despite deer. We began Earth Day, our first volunteer day at Pleasant View, with words and a prayer offered by Rev. Gerry Green (in green vest). Photos above from Lauris Hunter - click on photos above to seem all. Merikay, Project Leader, may look funny in her pink hat (thanks to the recent Women's March) but she's easy to spot for the 100+ volunteers who want questions answered. We worked despite drizzly rain. 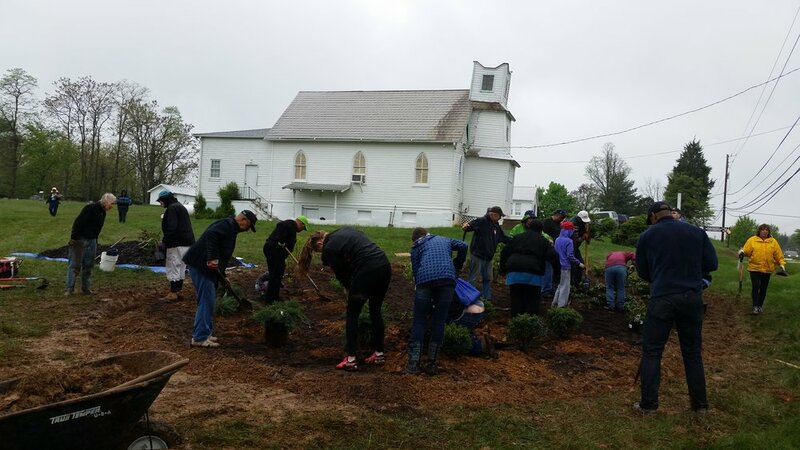 Earth Day at Pleasant View -- over 110 volunteers worked despite light rain. Check out the gallery of photos below by clicking on the photos. If you have some to add, email them to Merikay at merikays@verizon.net. We're not yet done -- work continues through 2018. Click above to see more of our Pleasant View friends (10 photos). The last photos feature Esther Lyon's great grandson. Matt Markoff (above) spent two days scraping the sod from the planting areas. We absolutely could not have done this project without his help. Matt is a co-leader of Earth Stewardship East. 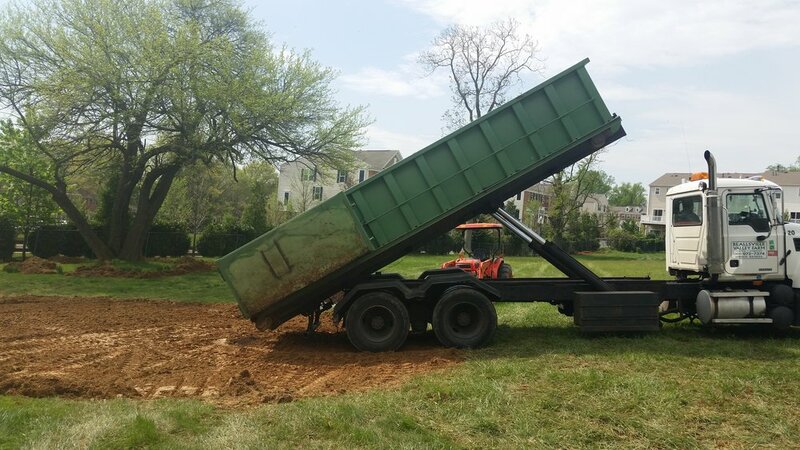 He also donated and delivered the piles of mulch that we used on Earth Day. Carolyn Thompson, a trustee of Pleasant View, spent days gathering the food/drinks and preparing the school for our event. Dara Ballow-Giffen arranged for us to get 100 free perennials donated by Pope Farm -- and she picked them up for us and delivered them to Pleasant View. Lee Anne Gelletly also donated substantial numbers of native plants from her garden. 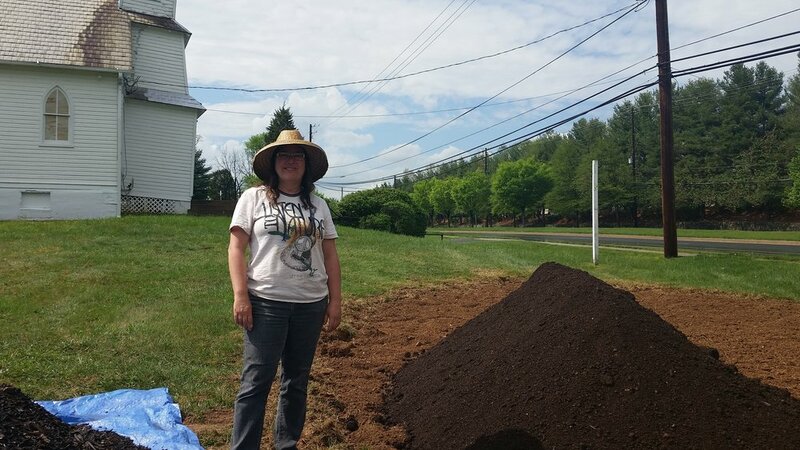 Thanks to Dara Ballow-Giffen we are receiving 100 donated native plants from Pope Farm Nursery. Merikay has been in contact with the MD State Highway Department and they have approved our planting design. Carolyn Thompson of the Pleasant View Trustees is recruiting people from the Pleasant View and Fairhaven community. The Trustees have had dead limbs removed from the large old tree to prevent any hazards from falling branches. Photos from April 29 - a long work day at ~90 degrees. Stalwart volunteers worked for hours in the heat -- thank you for your help. Click above to see more photos. To date between the four volunteer events we have had 200+ volunteers work on the conservation project! This is the number of volunteers totaled from each of the events -- some people came to 2 or more events. 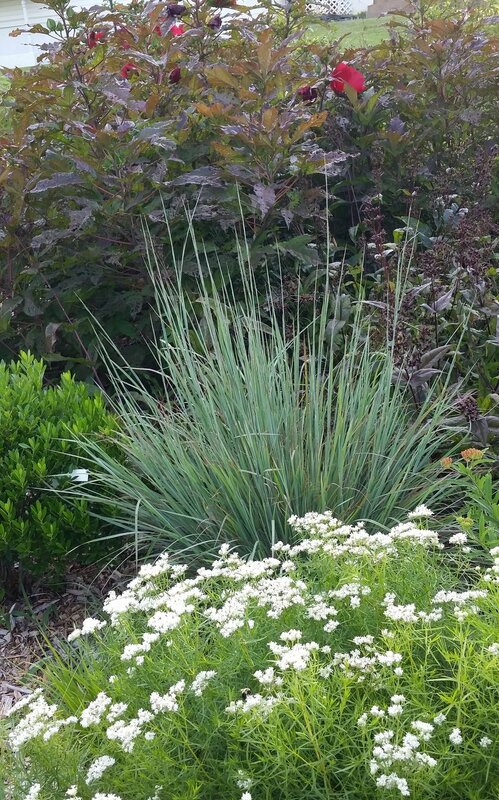 Come learn about native plants that might work for your home or neighborhood gardens: Tuesday, May 23, 7 p.m. Pleasant View school house. (This event was well attended — filled the historic school completely.) Our second educational event was a tour of Constitution Gardens in Gaithersburg — a park with native plants and interpretive signs and demonstration storm water management areas. Merikay Smith and Master Gardener Lauren Hubbard were on hand to answer questions. The final educational event was held in the Lakelands Clubhouse, February 2019, where 30+ local residents learned about ways to improve storm water management at home. If you have a group that would like these talk to be given, contact Merikay Smith. We want to share this information as broadly as possible in our community. Below are some of my favorite photos of our April 2017 event when we launched the Pleasant View project. What a pleasure to get together as a community to create beauty and heal nature. Old photo of the Pleasant View Church. Unfortunately all of these mature trees are now gone and the front steps are overgrown. As I talk to people in the community, many think the church is no longer in use. They're wrong. A small (~9) group of friendly folks meets there each Sunday - Mt. Olive Christian Church. Helen Woods is their Pastor. Stop by one of their services on Sunday morning. Sunday School at 10 am; Worship Service at 11:30 am. View on May 3 after beds are planted and mulch is applied. Above is a rough draft of the landscape design plan. 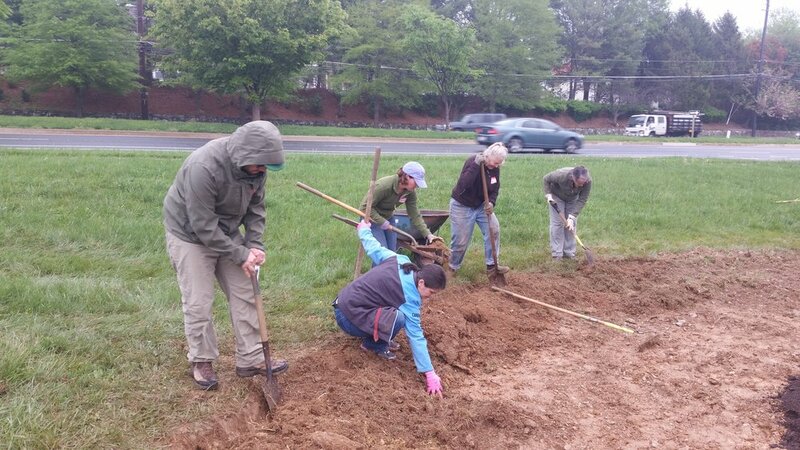 Our proposal calls for planting more than 500 native trees, shrubs and perennials in a landscaped area just under 5,000 square feet along Darnestown Road. The conservation landscape replaces weedy grass which slopes away from the church to a drain. Our landscape will provide a visual buffer between the cemetery and street as well as improved storm water management and natural habitat. Funds for a bench and stone path were not allowed in our grant. We are looking for individuals or groups who might donate funds for these amenities which will greatly enhance the public's pleasure in visiting this site. Contact Merikay if you wish to make a tax deductible donation towards these items. We welcome any individuals or groups to join with us on this project. 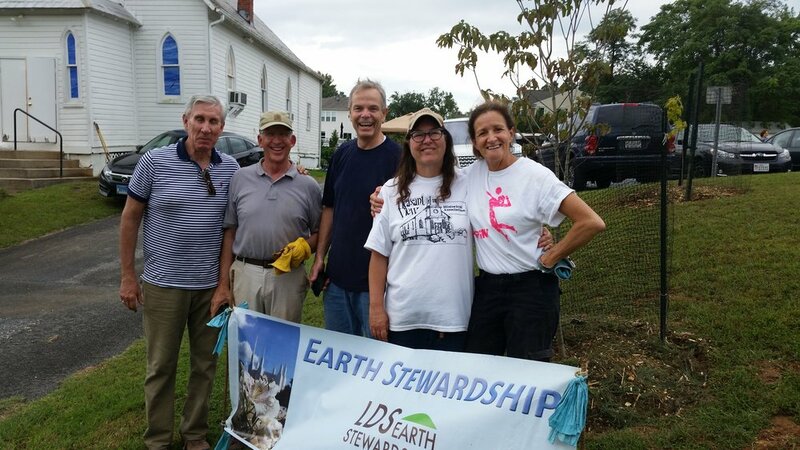 Leaders of the following environmental and faith groups have supported our project: Pleasant View Trustees, Muddy Branch Alliance, Seneca Creek Watershed Partnership, Fairhaven United Methodist Church, Mt. Olive Church, Church of Jesus Christ of Latter-day Saints (Kentlands Ward, Bethesda Ward, Potomac Ward, Montgomery Branch), Darnestown Presbyterian Church, Seneca Congregation Church, Prince of Peace Lutheran Church and ROI All Stars. Funds for this Pleasant View project come from the Montgomery County Water Quality Protection Fund through the Chesapeake Bay Trust. We hope to include the non-native quince tree for Quince Orchard. Cydonia oblonga. Brown-eyed susan will be transplanted from my garden as filler for gaps where shrubs will eventually grow. **Asters will be added in the fall to fill in gaps. ^ Beautyberry, buttonbush, red-twig dogwood and garden phlox will go in front of fence near drain. Native grass: Panicum virgatum 'Heavy Metal' and 'Northwind' are of the blue-green leaf variety and 'Huron Solstice' has more burgandy-green foliage. Little Bluestem, Schizachyrium scoparium is a smaller, blue-green grass. Select based on available options. Plants marked * are donated and not counted in the total for cost estimates. Substitutions may occur depending on plant availability and price. I will contact local vendors and will select the best combination of price and plant quality. Photos above from Linda Stein, April 29.